Next week, leaders from throughout Africa will descend on Washington, DC, for a first in the history of US-Africa relations: a White-House led US-Africa Leaders Summit, the largest event that the US has ever held with African heads of state. The 3 day summit will focus on African trade and business, security, health, and how to invest in Africa’s future. At GeoPoll, one of our main purposes is to research the issues most important to everyday Africans, using mobile phone surveys to directly communicate with those in previously unreachable areas. Previous GeoPoll findings include how Africans in certain countries are using mobile money, what television channels they are watching, and how mobile data can be used for food security action in Africa. Now, we are presenting findings on several simple questions which have been running in Benin, the Democratic Republic of Congo, Ghana, Kenya, Malawi, Nigeria, Rwanda, Tanzania, South Africa, and Uganda. 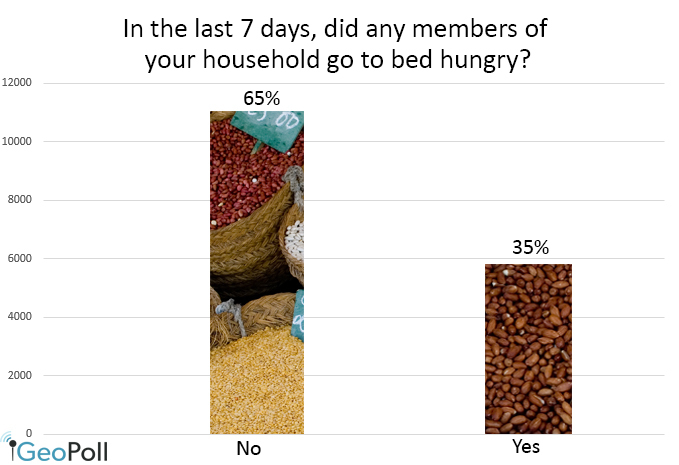 Our food security question asks respondents “In the last 7 days, did any members of your household go to bed hungry? 1) Yes 2) No”. While this question doesn’t get to some of the intricacies of food security, which we explore more in depth with our food security product, it does provide a simple, uncomplicated answer regarding hunger. Over all 10 countries, out of almost 17,000 respondents 34% responded yes. We found that the percentage was highest in Rwanda, where 44% reported that they or a member of their family had gone to bed hungry in the past 7 days, and lowest in Malawi, where only 26% said the same. That Rwanda struggles so much with hunger is not surprising, given that 37% in Rwanda live in extreme poverty. Continuous access to power is one of the most important factors in a nation’s growth, as energy is essential for starting and running small businesses, hospitals, and governments. Many countries in Africa have unreliable energy at best, and rural areas often have no access to power sources. Even in large cities such as Nairobi, blackouts are commonplace. GeoPoll asked respondents “Did you have continuous power at your home yesterday? 1) Yes 2) No” to get a sense of energy issues throughout Africa. We found the power grid to be the least reliable in Rwanda, where 65% of respondents did not have continuous energy the day before, and Nigeria, where 60% said the same. In South Africa, the most developed of the nations surveyed, only 32% did not have continuous power the day before. Next week we will be posting another blog which will include findings on Mobile Money, Health, and Media trust in Africa. Be sure to check back, and follow us on twitter @GeoPoll for more updates on GeoPoll surveys! Image: Africa at night, source: Wikimedia.